Congratulations to Fr. Matthew Allman who completed the Marine Corps Marathon last Sunday with a time of 4:57:23. Though he was an experienced cross country and track athlete in high school, Fr. Allman just recently returned to running and the Marine Corps event was his first marathon. 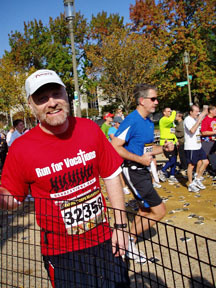 He ran as a member of the Archdiocese of Washington’s "Run for Vocations" team. Members collected pledges to support vocations awareness. Fr. Allman is completing post-graduate studies at Catholic University in Washington, D.C. He professed vows as a Redemptorist in 1994 and was ordained in 2000.